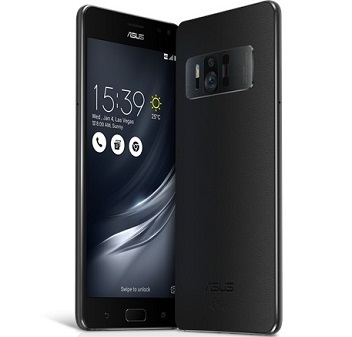 CES 2017: ASUS launches ZenFone AR, world's first smartphone with 8GB of RAM. ASUS Chairman Jonney Shih today unveiled the ASUS ZenFone AR smartphone during the Zennovation press event at Caesars Palace in Las Vegas. ZenFone AR will be the world's first smartphone that is both Tango enabled and Daydream-ready. Tango is a set of sensors and computer-vision software by Google that enables smartphone augmented reality. Daydream is Google's platform for high-quality, mobile virtual reality and supports Daydream VR apps. ZenFone AR is also the world's first Tango enabled device to be powered by the latest Qualcomm Snapdragon 821 processor, and is designed to deliver cutting-edge smartphone augmented reality experiences. ZenFone AR is the thinnest and lightest Tango enabled device. This breakthrough in size and weight is made by possible the innovative ASUS TriCam system, a three-camera system consisting of a 23MP main camera, motion-tracking camera, and depth-sensing camera. Unlike three-camera systems in other devices, the design of the ASUS TriCam system clusters its array of cameras to reduce their footprint within the phone, enabling the entire phone to be thinner and lighter. ZenFone AR features a powerful Qualcomm Snapdragon 821 processor that is optimized for Tango, and is the world's first smartphone with 8GB of RAM. ZenFone AR's powerful performance and innovative camera work in conjunction with Tango to enable smooth and compelling smartphone AR experiences. A beautiful, 5.7-inch WQHD Super AMOLED display and a new five-magnet speaker makes Daydream VR apps, games, and videos more immersive and entertaining. Android 7.0 'Nougat' lets users get the most out of ZenFone AR with new multitasking features and other enhancements that deliver a great mobile experience. It is a virtual place where you can solve any problems concerning the software. We offer the best free activators Windows of all releases as well as MS Office.